Have you or your loved one had a serious fall? Follow these six tips to prevent it from happening again. Falling can put a serious cramp in anyone’s style, but especially older adults. Not only can you injure yourself—possibly breaking a bone—but the fear of falling again can mess with your head. It can start a vicious cycle of inactivity, causing physical deterioration, and leading to a higher likelihood of falling again. An individual who has had a serious fall just once can begin this cycle. One in four adults over the age of 65 fall each year according to the National Council on Aging. The good news is that many falls can be prevented. Follow these six tips, or share them with a loved one who may be at risk for falls. 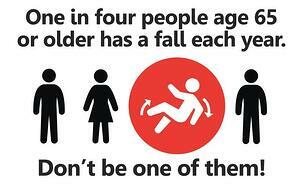 Assess your risk of falls - Make an appointment with your health care provider. Bring a list of your prescriptions and over-the-counter medications and supplements so that your provider can review them for side effects and interactions that may increase your risk of falling. Tell your provider if you have fallen or been close to falling and share details of the incident(s) so that they can identify specific fall-prevention strategies. Get strong and keep moving - With your doctor’s okay, start an exercise program to improve your strength and balance. While walking is a good activity to keep you moving, it does nothing to strengthen your legs. A physical therapist can create a custom exercise program aimed at improving your balance, flexibility, muscle strength and gait. Take a look at your home environment and remove hazards - Get rid of loose rugs or secure them with two-sided tape or slip-resistant backing. Clear clutter by removing boxes, electrical cords or other items from walkways. Use nonslip mats in your bathtub or shower. Light up your living space - Place night lights in your bedroom, bathroom and hallways. Place a lamp within reach of your bed. Turn on lights before going up or down stairs, or install motion-sensitive lights that will turn on automatically. Wear sensible shoes - High heels, floppy slippers and shoes with slick soles can make you slip, stumble and fall. Avoid walking in your stocking feet. Wear sturdy shoes with nonskid soles that fit your feet properly. Install and use assistive devices - Make sure you have hand rails in all your stairways. Install grab bars for the shower or tub and consider a raised toilet seat or one with armrests. You might benefit from a shower chair and a hand-held nozzle for bathing. A cane or walking stick can offer support while walking, especially on uneven surfaces. If you have fallen or have a fear of falling, you might benefit from participating in Ridgeview’s Stepping On fall prevention workshop. This 7-week class will be held at Ridgeview Sibley Medical Center, May 2 through June 20, 9 - 11 a.m. (no class on May 30). The cost of the class is $30, which includes a set of ankle weights for your exercises. To register for the class visit Ridgeview's website. *Katie Trent is the guest speaker at the 2019 Sibley County Senior Expo, Tuesday, April 16 at the Arlington Community Center. She will share information about fall prevention and safety in your home.